We all have a lot of prewritten content or PLR that we've purchased with the best of intentions sitting on our hard drive collecting virtual dust. I don't have to tell you that it does you no good until you actually use it. And guess what… the key to making that happen is to get into the habit of using PLR or prewritten content regularly. In other words, make it part of your content marketing strategy. Getting into the habit of doing this week after week is easier said than done. We seem to acquire bad habits without any effort, but getting into a “good” habit like publishing a fresh PLR article each week can be a little more challenging. Let’s break it down into a three step process that makes it easy to follow until we’ve internalized the new publishing routine and made it a true habit – something we do automatically without having to think about, like checking email. The first step is to decide what you want that new habit to be. Be as specific as possible. Don’t just tell yourself you want to use more pre-written content. Instead say something like “I will publish a new PLR article on my blog each Wednesday morning”. Deciding what your new content marketing habit will be and committing to when and how you’re going to do it, is half the battle. The next few days should be smooth sailing. You’re motivated and excited to get this done. Sticking to your new habit of using PLR content isn’t an issue. But a few weeks in you’ll notice that it’s easy to slip back into old habits and forget to put those pre-written articles to good use. Maybe you're in the middle of a big product launch and just don't think you have the time or energy to publish a new article. Or maybe your day just gets away from you and you forget to tackle this task. This is when it’s important to have a reminder. Set an alert on your phone or add the new habit to your calendar or to-do list for a while. Which brings us to the last step. It takes some time before a new behavior becomes a true habit. Until then, a routine will work to your best advantage. Even before the new behavior becomes automatic, a routine will help you get it done without having to spend a lot of willpower or relying on frequent reminders. Make that weekly post part of your marketing and content generation routine, or change from spending all morning checking Facebook and playing around on social media, to taking 30 minutes each workday to work towards publishing the weekly article. On Day One, you pick the PLR content you want to work with. On Day Two you paste it into your blog as a draft, craft the title, and do some simple formatting. On Day Three you give the content a quick edit and tweak. On Day Four you create a graphic and finalize formatting. On Day Five you hit publish and promote the new blog post. Congratulations! Decide to create the new habit, practice the routine until it’s second nature and you’ll be well on your way to forming a new habit of actually using your pre-written content. 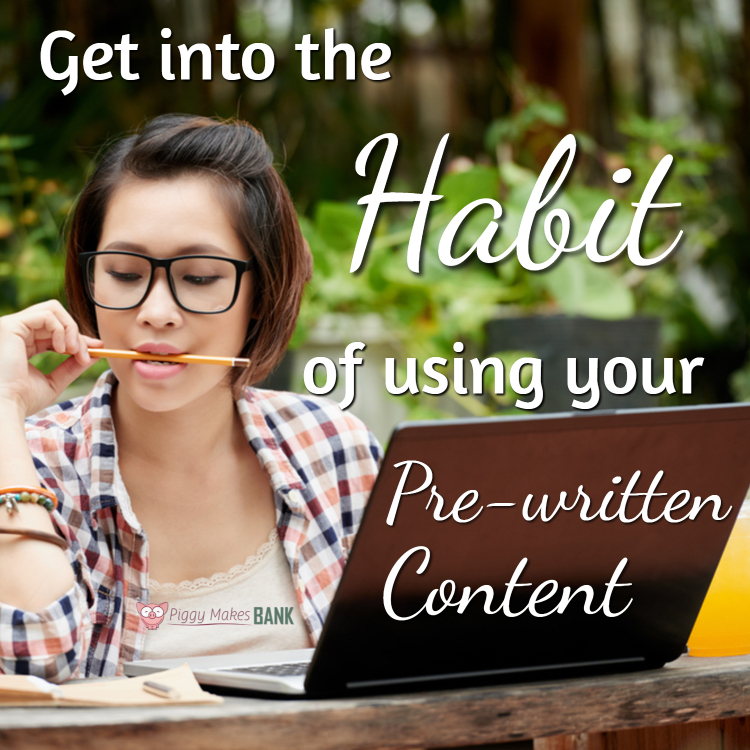 Would you like a little extra help with getting into the habit of using your pre-written content? We'd like to invite you to check out our mini memberships here. Not only do you get a manageable amount of content each month, we've also developed a series of training emails that encourage you to use the content in a wide variety of ways. Think of them as reminders to stick to your new habit of using PLR to grow your business. You also get access to an active community of online business owners and the two of us to talk strategy, answer questions, and stay motivated.